Stompin-Ground.com Spiral Wrap Tool <img src="https://stompin-ground.com/pics/made-in-usa.jpg" alt="Made in USA" /> This tool makes wrapping easier. This tool makes wrapping easier. A one-time price of $3.49 will be added to your order. The spiral wrap tool is optional but handy. This small plastic tool helps apply the spiral wrap more easily. Just thread the tool on the wrap a few turns, apply the wrap on one of the cables to anchor it, then just pull the tool to stretch it out and then wrap. As you repeat this process, you will need to untwist the spiral wrap that is not yet wrapped around the cable as it will get too tight to pull. 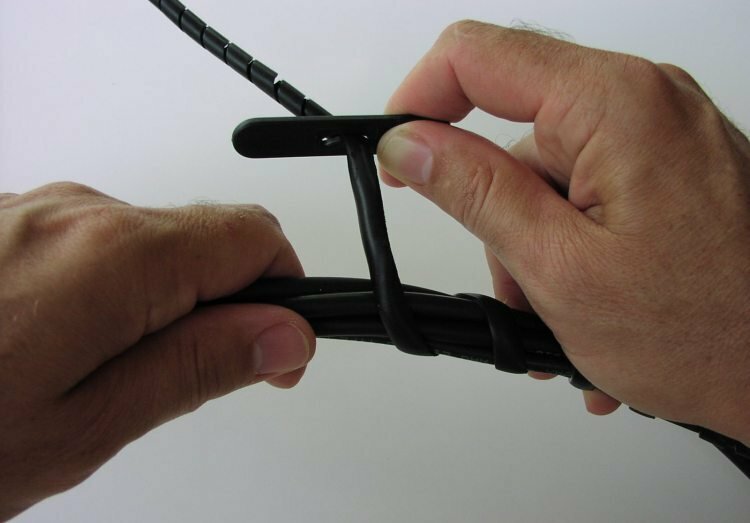 To keep your bundle flexible, the cables should be slightly twisted inside the spiral wrap as shown. You will loose about 4% of your total cable length when your wires are twisted in this manner. For reference, while bundling 5 cables with 1/4″ spiral wrap, add about 30% to the length of spiral wrap you order to obtain the desired wrapped length. For example, if you wanted to wrap a 10′ section, order 13′ of 1/4″ spiral wrap. This should allow the 10′ wrapped section and a few inches on each end to anchor the spiral wrap on a single cable. Keep in mind you will want to have a "fanout" on each end of a length you determine. • Select your size (diameter) below. • Quantity = Length in feet.